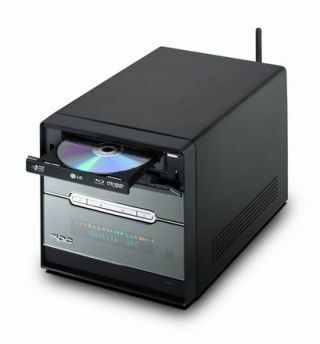 Shuttle has unveiled its new XPC G5 6801M this week, described as a "mini-PC Media-Centre for Blu-ray and HD DVD". It’s Shuttle’s first AMD-based HD-compatible mini-PC system and, with the aid of a single HDMI cable, can transfer high def movies to your HD flat-screen televisions. Specs wise, the XPC G5 6801M features… breathe in… an AMD Athlon 64 X2 4200+ processor, 2GB of DDR2 RAM, a 320GB hard drive, the aforementioned Blu-ray / HD DVD combo drive, ATI's 256MB HD 3450 graphics card, a DVB-T tuner, 25-in-1 multicard reader and 7.1-channel audio output. "The LG GGC-H20L Combo drive is suitable for both HD formats and AMD's Athlon 64 X2 6000+ processor and in conjunction with the 2GB DDR2-800 memory delivers the required performance for fluid playback", according to Tom Seiffert, head of Marketing & PR at Shuttle. Shuttle’s release also adds that its latest mini-PC is rounded off with 8-channel audio, Gigabit-LAN, FireWire, six USB-Ports and eSATA-Ports. The Shuttle XPC G5 6801M is available immediately in specialist retailers at an RRP of 1,234 euros (excluding VAT).